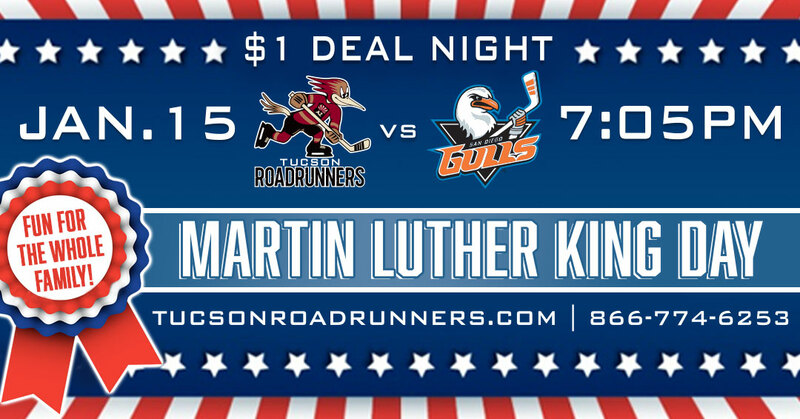 TUCSON, AZ – The Tucson Roadrunners, proud American Hockey League affiliate of the Arizona Coyotes, return to Tucson Arena this Monday evening for another I-8 Border Cup rivalry game against the San Diego Gulls. Tickets for the game can be purchased HERE, however children bringing their most recent report card to the Tucson Convention Center box office, will be rewarded with a free ticket with the purchase of an adult ticket. Digital copies of report cards will be accepted. With puck drop set for 7:05 pm, the contest will also feature $1 hot dogs, popcorn and soda at concession stands all evening long. Tucson earned the victory in the latest matchup for the I-8 Border Cup Trophy, coming on December 27, however, trails in the series six points to five. The Roadrunners new Hat Trick Ticket Package, which features three ticket vouchers and a team cap, is on sale now and starts as low as $48. For more information or to purchase one, call the Roadrunners today at 866-774-6253.